Scoliosis is a medical condition characterized by abnormal, sideways curvature of the spine. It is quite common condition, currently affecting more than 4 million Americans. Although the exact cause often goes undetermined, it is believed that traumatic injury and bone abnormality are the most common contributors to scoliosis. The typical treatment involves a spinal-correcting brace or surgery, depending on the age of the patient. Regardless of which route is taken, it has been scientifically shown that exercise has critical role when it comes to treating this condition. This article brings the story of a grandmother who decided to take the matter in her own hands and treat her curved spine with exercise. For decades, Anna Pesce had suffered from scoliosis, specifically a severe kyphosis — a hunchback-like posture. 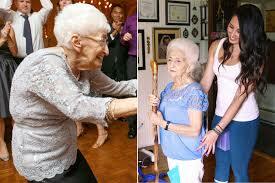 At the age of 86, her condition aggravated and confined her to a wheelchair. Back in 2014, she went on trip to Waganer, SC, to visit some relatives. However, at this point her health hit rock bottom and she suffered from debilitating back pain the whole time. “I had this horrible pain shooting up my back,” she says. Although the development came slowly, it had finally caught up with the New Yorker. But this granny refuses to accept her condition as fate. Pesce`s daughter came up with an idea to relieve her mother`s agony, and introduced her to a certified yoga instructor and back specialist. She decided to give yoga a shot and they soon began working on restorative poses and stretches. At first, the poses were difficult and even painful, everything soon fell into place. Amazingly, Anna was able to walk again within as little as one month! “After two months, another big milestone was that (Anna) knew what poses to do whenever the usual pains would come up for her,” the instructor says. Rachel Jesian, the yoga instructor, came up with these back-restoration poses after her own agony with scoliosis. After a series of useless treatments, she was recommended to try this one. “I had to wear a back brace for five years and went to physical therapy every week, but this was the only thing that worked,” says Jesien. As seen from Pesce`s story, yoga treats scoliosis too. With the help of her instructor, Anna has undergone a drastic transformation.